Who says that little dogs can’t be protectors? Chopper, a Shihtzu, has the courage of a lion in a body the size of a fluffy pillow. Harris, a 7-year-old boxer, was being attacked by a 100 pound Akita from across the street. 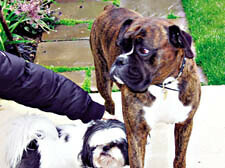 The Akita slipped through Harris’s owner’s security gates and dragged him to the front garden and began attacking him. Harris’s owner started to hit the Akita with a stick to get him off of Harris, when brave Chopper joined in and jumped at the Akita to save Harris (Chopper is one-fifth the size of the Akita). This entry was posted on Saturday, May 19th, 2007 at 3:50 am	and is filed under Dogs, National Dog, Cat & Pet Info, News for Cats, Dogs & Owners. You can follow any responses to this entry through the RSS 2.0 feed. Both comments and pings are currently closed. Our 12 lbs terrier mutt from the pound did not like to be startled so he growled at an adult Pitbull once and another time with a Boxer. I was all pretzeled up inside! I had a cat who had formed a great friendship with the cocker next door. They met at the hedge between the properties and curled up together for hours. When a truck pulled up to the curb and a large aggressive dog leapt out and attacked the little cocker spaniel, my cat rushed into the fray, jumped onto the back of the big dog and began raking with her claws. She eventually made her way to the dogs head and was working on his eyes - at which point the aggressor became the aggressee and didn’t like it one bit. By that time he had quite an audience as he fled screaming. Kitty dismounted and stalked back to the hedge. We figured her intervention had saved the cocker. My tiny Himi was rescued from a pound. Her front paws were declawed. She was always aloof and careful because my other two cats have their claws. One day I tried to pet my huge male cat (23 lbs of rippling muscle back then), He got mad and punched out at me with full claw. This 7 lb cat became a warrior. She jumped on his back biting his neck like a lioness. And she has no defenses. It was so brave. These heroic little animals will risk all. Truely, the Shih tzu lives up to it’s name, little lion! I have one that is the greatest little dog I could ever ask for and he gets the lion cut when he goes to the groomer, so cute. He has many cat like traits. They are bold little dogs, and Chopper is proof of it. Wow, God bless him! 1) The Akita’s owner is obviously an idiot and a lawsuit-in-waiting. Do the British not have legal recourse against dangerously irresponsible idiots? 2) The Boxer’s person needs to keep something considerably sharper and stronger than a stick around for protection in her own yard. Self-defense is a basic right. She shouldn’t live in fear on her own property. If the Akita returns, she should also put her arm or leg between the two big dogs. One scratch on her from the Akita and, FINALLY, the British legal system will permanently resolve the issue. I find it appalling that it would take a wound on a human rather than the near-death of an animal to declare another animal “dangerous.” Unreal. 3) This newspaper let the Akita’s idiot owner get away without a public identification simply because he refused to give his name? His name is public and it should be printed for all to see. He shouldn’t be allowed to hide, especially since he believes his Akita did nothing wrong. Coward. Little Chopper has a thousand times the coward’s courage. In a situation where large dogs are “known” to be aggressive and come into your yard after your pet,…………….cattle prod is a good defense weapon. If this prod can move a 1200 lb cow. I would think a 150 lb dog would be inclined to back off.